Some moments are just meant for sharing. 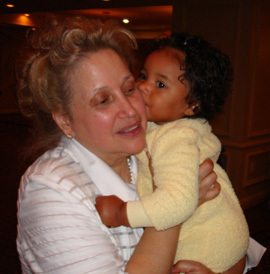 Kathy DiFiore - our Founder - is blessed to have so many of our Several Sources Shelter "saved" babies in her life. This little girl shared her love for life with Kathy at a recent fund raising event. Again, what could have been a family broken apart now is a family sharing in the life of a wonderful little child because her young mother had the courage of insisting that she would keep her baby. This is a collection of the feedback we have received over the years from visitors of this website. We thank you so much for all of your kind words! I was looking at all of the sites on the internet to find out good research materials for a debate speech that I decided to do on Pro-Life Abortion. When I saw your site I was thrilled because it was such a blessing to see a Christian organization, like yourselves, be such a good witness to mothers and unborn children. 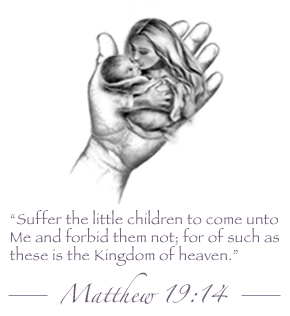 I know that God is pleased by your efforts to save the unborn's lives. I know that if Christ was still living on earth that he would be pleased with you as well. I just wanted to thank you for making a difference in the Kingdom. You are an inspiration to me. Thank you. May God bless your efforts that are done out of a servants heart. I will be praying for you. I visited the Silent Scream Homepage, and was really affected by what I saw. Thankfully, my pro-abortion days are long over. As a teenager, I believed the lie that it was the woman's body, and therefore, her choice. I now realize that it is the child's body that is destroyed. Like the bumper sticker says "Abortion = 1 dead, 1 wounded." I am angered by the money-making focus of anti-child organizations like Planned Parenthood. If we are going to be a nation of choice, at the VERY least, women should be shown this film, so they can make an INFORMED choice. I applaud your work, and I pray that God continues to bless your efforts. Thank you again for having me on your e-mail list. Thank-you for the photo of the little girl named Kathy who was saved from an abortion!! I can not always download what you send because it takes too long. But this one was not that long and gosh! what a blessing to see a beautiful little child who was spared from the abortionists scapel. Tell her mother that she is a blessed woman to be the mother of an alive baby!! Please pray for a friend of mine, Peggy, who had an abortion 10 years ago and has had failed relationships and now is ending a five year marriage in divorce. I truly believe that post-abortion counseling will help her regain her self-esteem. But she needs to be open to that. Will you pray for this? I really enjoyed this web site. I wish that there was some way for me to help but I am struggling with rent and my bills as it is. Volunteering is out of the question considering I live in Washington State. I have seen all of the other web sites constructed by Kathy and the Several Sources Shelter. A year ago me and my girlfriend had an abortion. I have regretted it ever since. I stumbled across the Lifecall web site some time ago, and I was moved by the love and caring the Several Sources Shelter showed to all the unwed mothers they help. I wish I had that kind of support when my girlfriend was pregnant. But that was in the past and I am happy to see that there is someone out the willing to help other people not make the same mistake I did. In a world so full of cut-throat business I am very relieved that there are people that still help others. The poor and homeless is a problem that has gone on for far too long. I am very happy to see people trying to help and I wish I could help also. How can I help??? Thank you for your kind words about our websites. I wish I had known you and your girlfriend when you could have really used our help a while ago. Know that God forgives all sins. We have to ask and promise not to do the same again. In the meanwhile you can help by going into the Teen Chat rooms and mentioning from time to time our website .... www.lifecall.org. Maybe you will be able to help another young person who is now in the same situation you found yourself a while ago. You are in my thoughts and prayers. Stay in touch. I would just like to thank you for the information and the website page. I think a few of those kids actually learned something. It's hard to get people to open their minds, but you did a wonderful job. I would love to hear from you and maybe receive some more information about abortion. I'd be willing to help out in any way I can. If you could e-mail me back, I would really appreciate it. Thanks again, and keep up the good work! You have a great tool with your web page, I have added it to my favorite places and will tell all that I get a chance about it. I especially loved the developement of the baby, if that does not make a mother think twice I do not know what would. I think though what I love best about you and your page, is it in not condemning but shows love, as sweet as the honey that falls from the comb as Spurgeon use to say. I will start looking in some of these teen chat rooms as you asked and hope that God will give me some to send to you... I once again appreciate all that you do, do you have anything that you could send me that I could give to some of the churches around here to encourage support, if you do send it I will try to round up some. Well give yourself and all those precious mothers and children a big hug from me, and I pray that God uses this page for the lives of the children and mothers sake.